The MGB engine mounting installation is set up so that when the engine is under torque one mounting will tend to be in tension and one in compression. 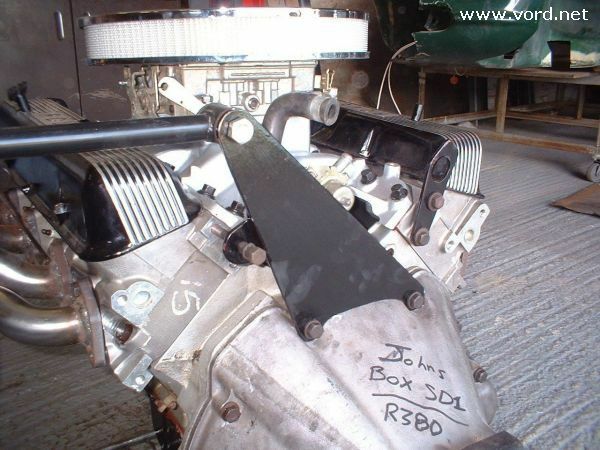 This is OK when the engine doesn't produce a great deal of torque, but bonding between rubber and metal is poor in tension and my old V8 engine would quickly pull it's mountings apart. The engine steady bar is intended to reduce the movement of the engine under torque and also prevent tension loading of the mounts under torque. I fitted a tall bracket to the engine so that the steady bar was horizontal. This ensures that the steady bar doesn't influence the vertical movement of the engine. I mounted the bracket to the gearbox mounting bolts rather than the cylinder heads as I was wary of head gasket problems if I loaded the heads. The bracket has a lateral support to the head to reduce the likelihood of buckling and also increase the resonant frequency of the bracket to prevent ringing. The steady bar itself is a rear suspenion link from a modern saloon car and I just happened to know the bush characteristics. The bush has a low rate for 10mm of movement so should not result in harshness for small throttle openings. The bush will snub under full throttle and prevent further engine movement. 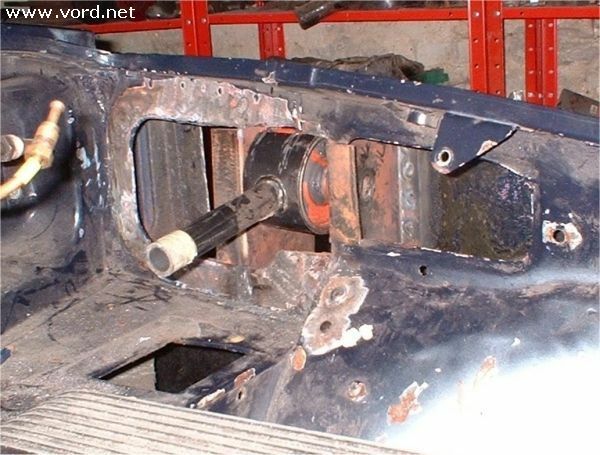 I welded two mounting brackets into the upper wheelarch reinforcing panel to support the bush, then boxed in the front face of the panel to increase stiffness. The finished steady bar has a threaded section to allow length adjustment. The bar clears the brake servo but I had to mount the screen wash reservoir further forward to clear the steady bar. The only snag I've found with this arrangement is the screen wash mounting makes it very difficult to torque the head studs or remove number 7 spark plug.